The useful shape made by the side-branch also makes the perfect angle for this haft. The angle between the handle (main branch) and the foreshaft (side branch) is about 65°. 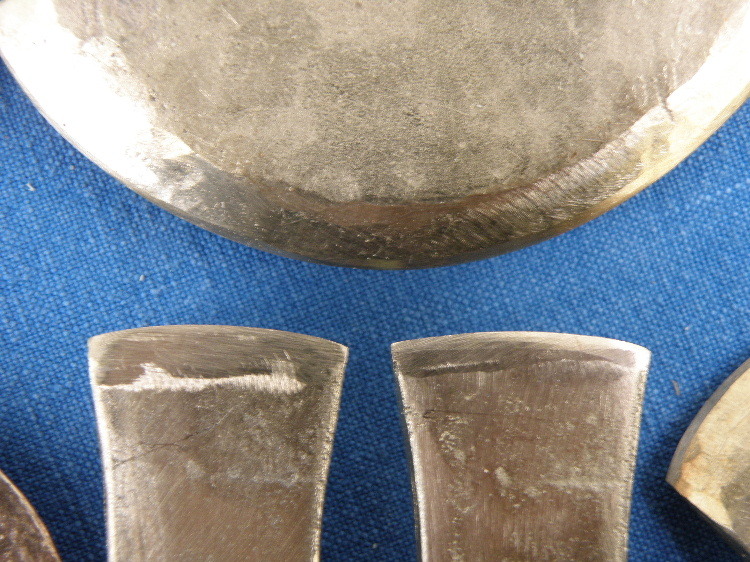 There are two wooden handles for socketed axe heads excavated from Perry Oaks, angled at 66° and 62.5°, made from similar branches with side-branches. 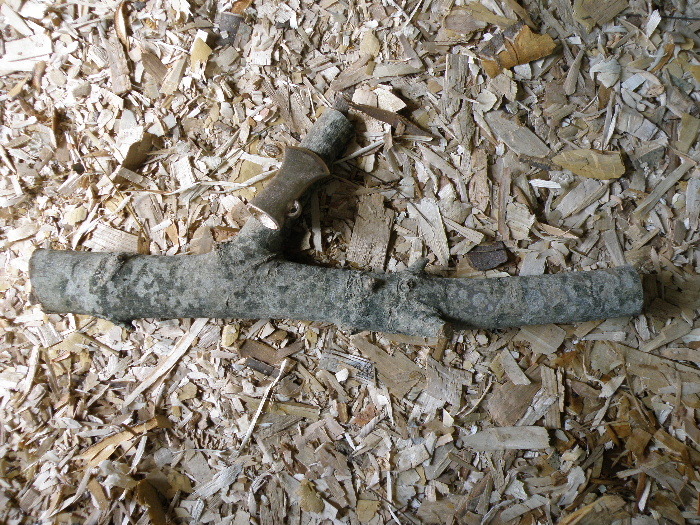 My handle can be up to 60cm long, given the way the piece of ash was cut before it got to me. The two Perry Oaks handles are 24.5cm and 70.6cm long, and both are close to 4cm thick. 4cm is a bit big for my hands. This means I need to prioritise the fit more to my hands, less to the archaeology. 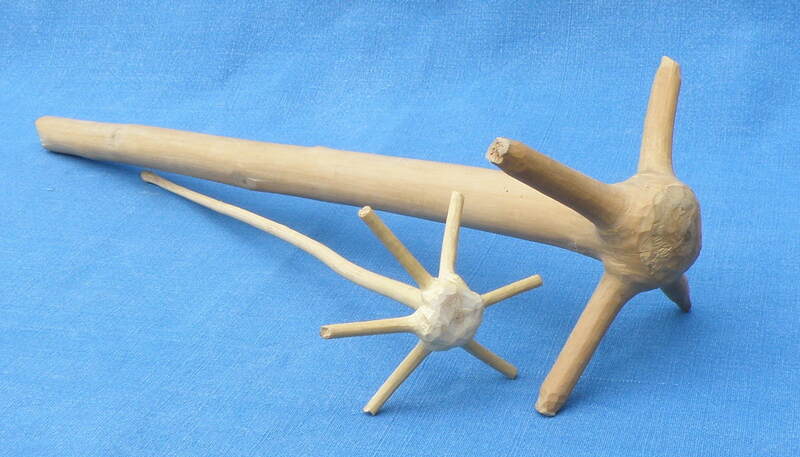 I’m not making a replica or facsimile; I’m making a working tool, that is based on the archaeological record. The Perry Oaks foreshafts onto which socketed axe heads would have been fitted are short, only 9.4cm and 7.9mm long. Marks on the wood suggest that the bronze axe heads fitted closely, butting up to the handles. At their narrowest points the Perry Oaks foreshafts are 1.8cm and 2.4cm wide. The socket hole of my axe head is this narrow only about one-third of the way down. I need my foreshaft to be a better fit than this, and I want to keep it longer so that I have the option of making it shorter and bringing the axe head closer to the handle later on. There was much shaping to do to make the foreshaft fit the socket hole, the most awkward part of the task. I could use the Flag Fen handle as an example to guide me. 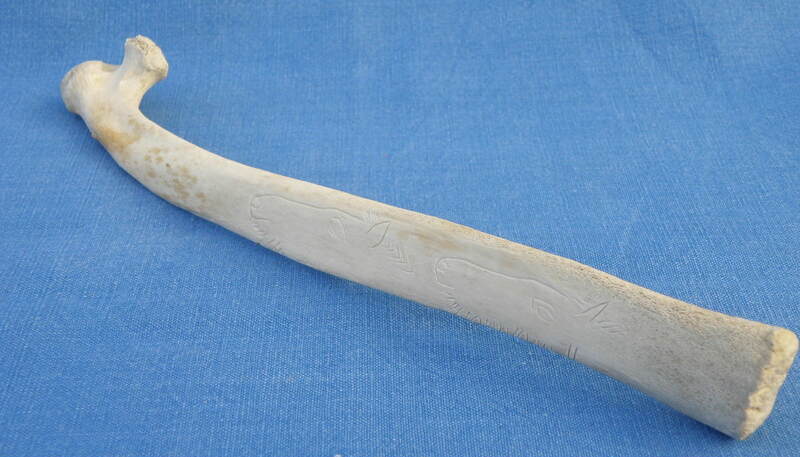 Its foreshaft is 44.3cm long, its axe head fitted onto the end leaving lots of space between it and the handle. The angle is more acute though, closer to 50°/55°. Its axe head probably needed to be further away from the handle to provide enough clearance. The naturally-grown shape is convenient, but brings some problems with it. There were other, smaller, branches growing out of the main branch. This means that the grain of the handle is knotted, not nice and straight. 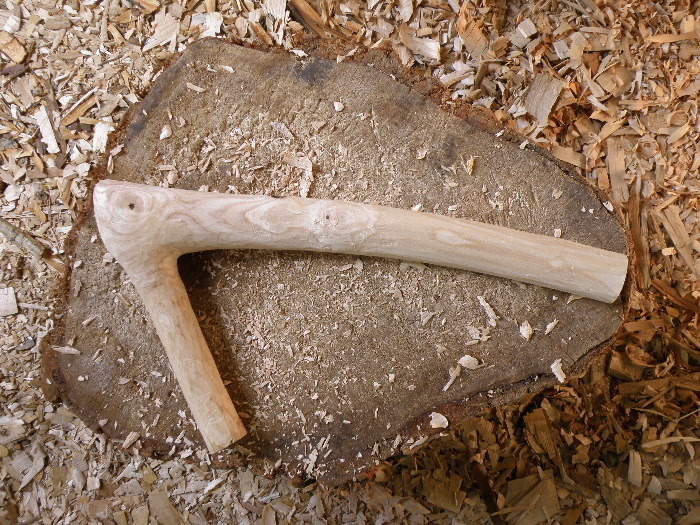 This makes it harder to cut a smooth, regular surface; more likely to get blisters and splinters using the axe. Cutting across the tumbled grain could create weak points. But it’s almost finished, so the proof of the pudding will be in the eating…or axing. I’m sitting quietly on the top floor of the Museum of Archaeology and Anthropology in Cambridge. A few other visitors have made it this far, but it’s been a quiet afternoon and I have the children’s activity table all to myself. It’s a very pleasing oak table, just over 2m long and about 1.5m wide. I can rest my feet on the bars that run lengthwise underneath the table. 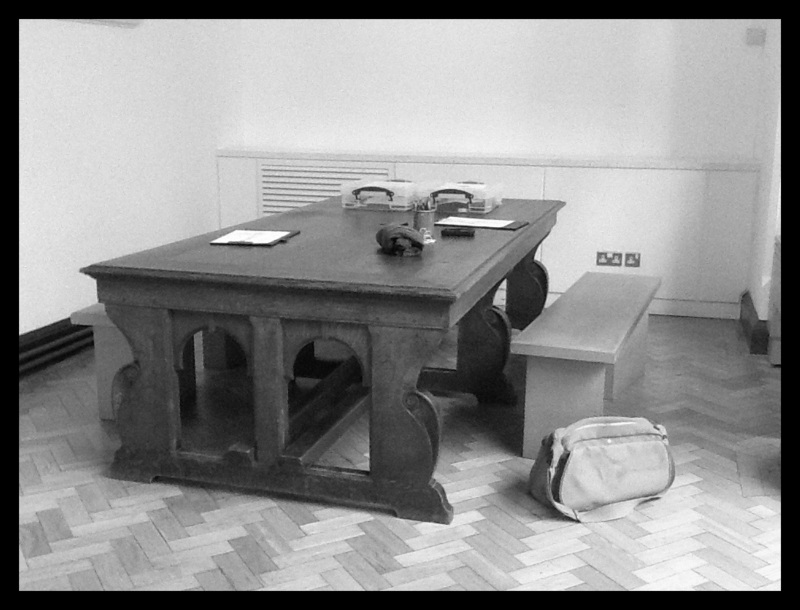 The museum has rustled up a couple of beech benches either side of the table. It’s very comfortable for a slouch like me. The table is welcoming. Its size says “come and sit around me, with your family and friends”. It’s like a refectory table for communal dining. There is nothing private or exclusive about this large and solid piece of furniture, even though it looks like it might cost more than many people could afford. At least, nothing exclusive about it given its context – in a nice open space in a nice open museum. Size can affect the way we look at objects. I’ve been thinking about the size of axe heads, because I am busily making handles for different types of Bronze Age axes. 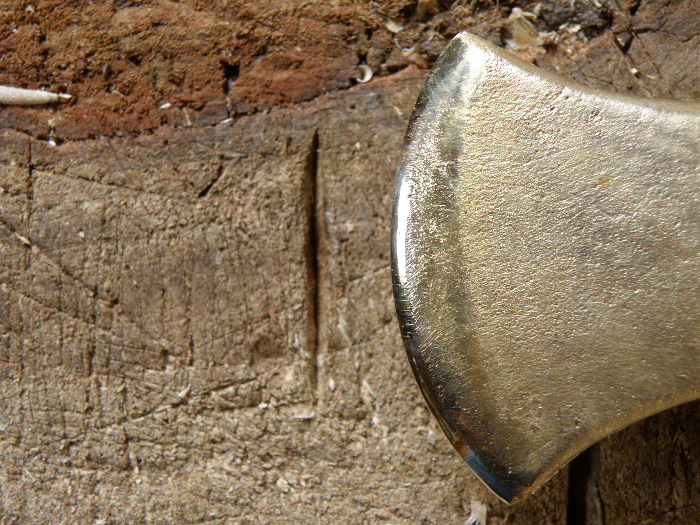 When is an axe head a useful tool, when is it a status symbol, when is it a toy or a trinket? It’s an axe head, right? So isn’t it a weapon, or for cutting down trees? Maybe you can imagine using one of these axe heads, if it was in a handle. Maybe not cutting down a big tree, but trimming branches to make timbers for your new round house, perhaps? Cutting rods to make a wattle wall? Chopping roots out of the ground to make it easier to sow seeds? Every time you sharpen a tool, you remove some of its metal or stone. Perhaps some of the axe heads on display had been sharpened for the very last time, they had got too small to be useful, they were discarded; only to be excavated more than 4000 years later by some busybody who wanted to collect up this refuse. This reduction in size, and its effect on the shape of the tool, is called the Frison effect. Some tools can end up looking completely different by the time they have been shaped and reshaped over and over. Archaeologists risk putting certain objects into many different categories, giving them different names, because of their different size, when actually they started out as pretty much the same thing. One of my favourite examples of this in the Salaman Collection of tools, looked after by the Museum of St Albans. It is possible to compare brand new woodworking chisels with ones that have been used for years, and are now only a few centimetres long because they have been sharpened so many times. 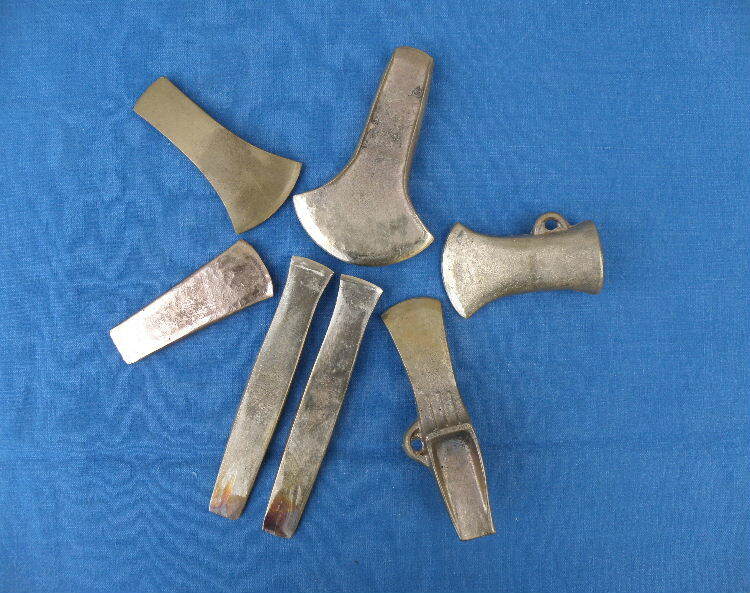 So why would anyone make really tiny axe heads? Some of these axe heads are just a few centimetres long. 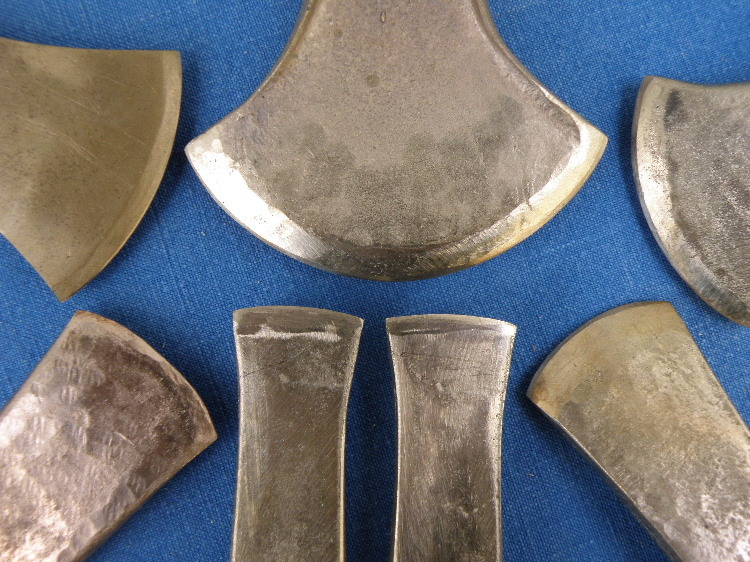 I think the curators have carefully placed them in this order in the front row: the ones to the right are shaped more like the bigger axe heads in the case; the ones to the left are more like the projectile points elsewhere in the case. 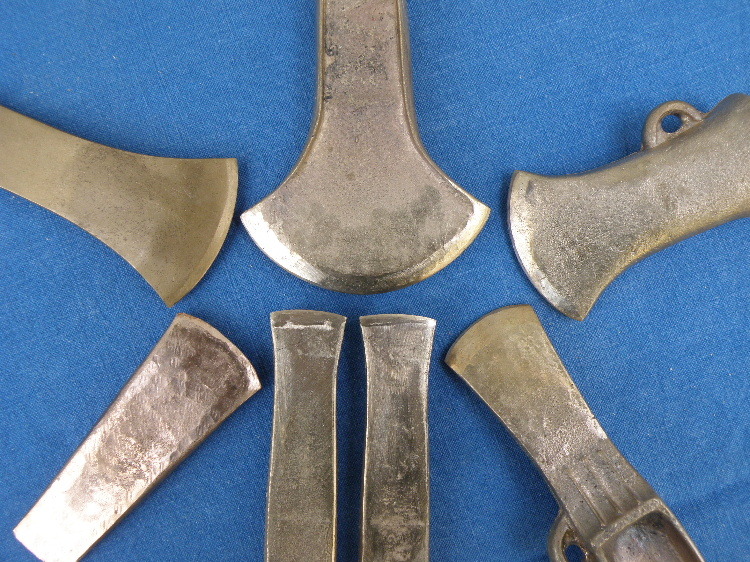 But apart from the two leftmost objects, the rest are at least axe shaped. 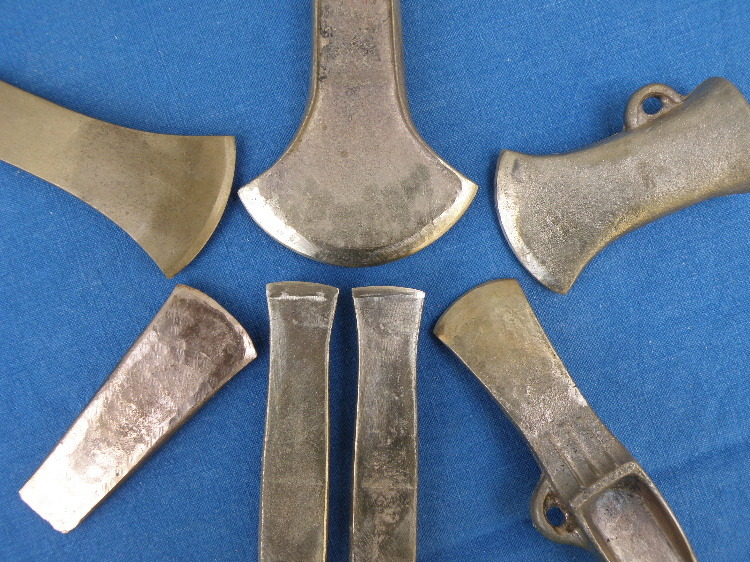 Four tiny axes, or four tiny chisels? Six projectile points? It seems that the decision depends on how these little shaped and polished pieces of stone can be used. Projectile points; they could be arrowheads. Not that they look like they were hafted onto arrow shafts. No resin glue sticking to the stone, no wood preserved in the lake village’s waterlogged deposits. 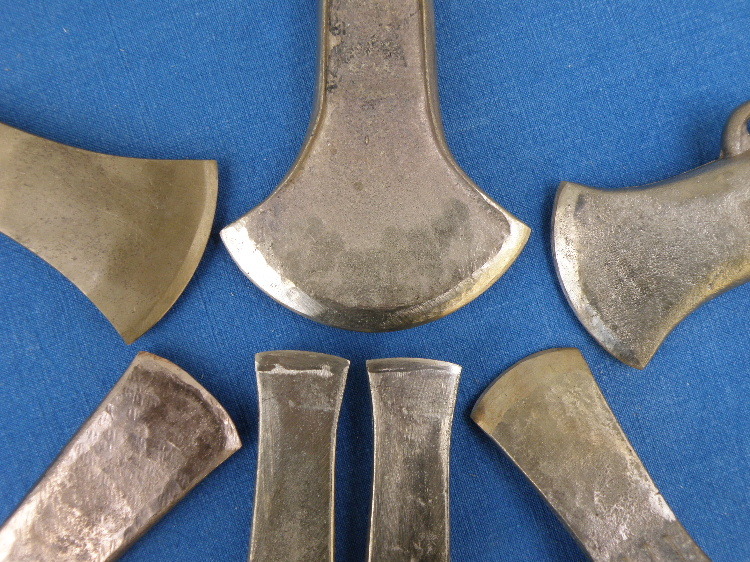 Axe heads; to cut what, precisely? But chisels, well maybe, sometimes you need a narrow and slim cutting edge for a fine piece of woodwork. They are beautifully shaped and ground pieces of stone. Someone went to the trouble to make them look like this. Let’s look at the other extreme. Big axe heads. Really, really big axe heads. I have chosen this pretty poor photo deliberately. 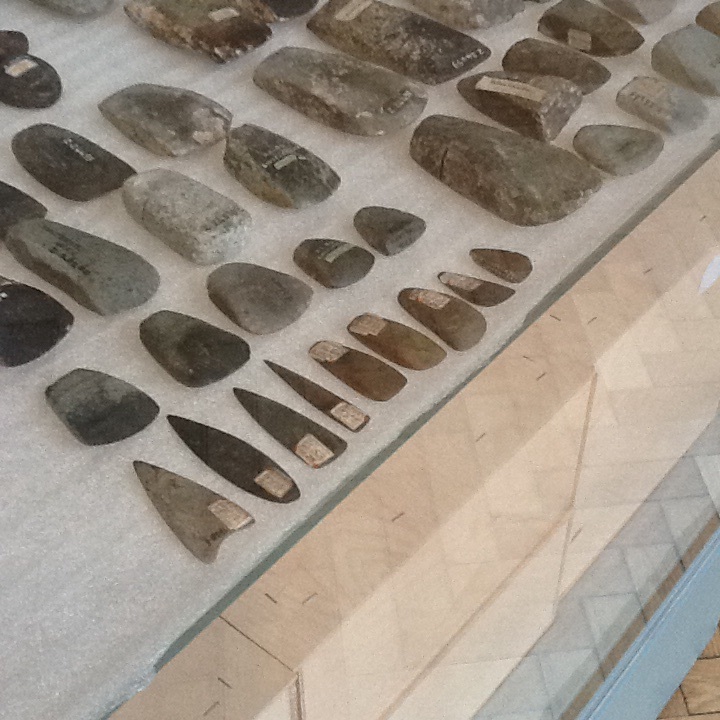 My mother couldn’t get the whole of this museum display into her camera’s viewfinder, partly because she couldn’t get high enough over the glass cabinet, and partly because the flint axe head on the left is just so big. The two other axe heads aren’t small either. But the biggest is the best part of 50cm long. 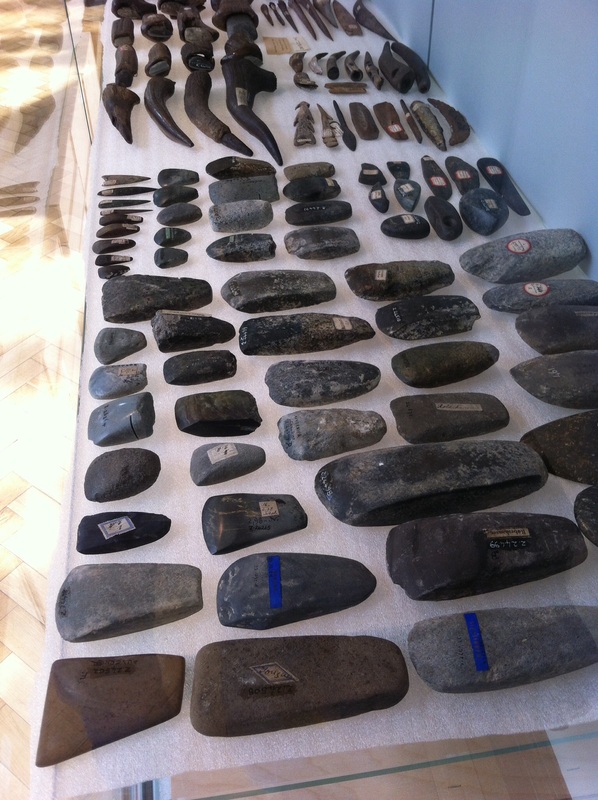 Neither do these beautifully ground and polished stone tools show signs of having been fitted to handles. They are on display, along with hundreds more, at the National Museum of Denmark, Copenhagen. then a flint axe three times the length must weigh around 1455g. That’s nearly 1.5kg, or the best part of 3lb. Even my heaviest steel axe head for carving is only 2.2lb, and is a compact shape with a socket to fix it to the handle. 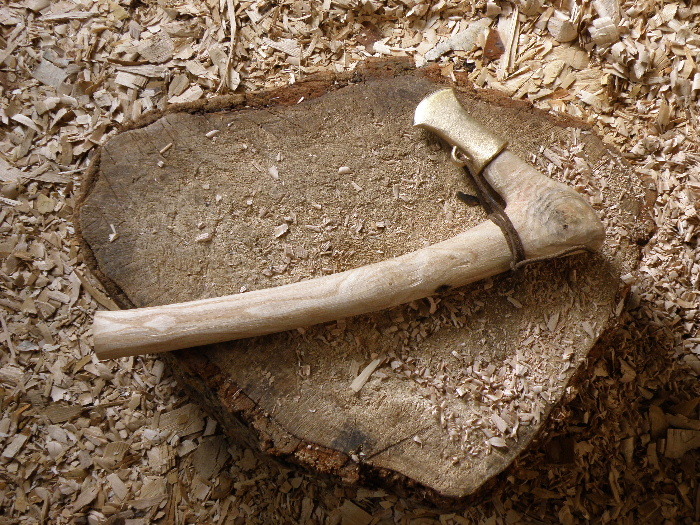 How do you think you would go about fixing that immense flint axe head in Copenhagen to a handle, to make a wieldy tool? A bit impractical, isn’t it? My point is that archaeological study of stone tools has often been the study of technology, and here’s where size really matters. Tiny objects and huge objects falling outside a “normal”, “useful”, size range can be seen as technological anomalies, and therefore as something special and not a tool at all; whilst everything else in the middle of the range is handy, practical, workaday. But it’s not that simple. Is it clear where, on the sliding scale of tiny-small-normal-big-huge, usefulness begins and ends? What about that Frison effect, and the result of reuse upon reuse? What is normal, anyway? We don’t use stone axes anymore, so it’s difficult to judge how these differently-sized objects were being used in the Neolithic, especially if we think only in terms of tools and weapons. In fact, it’s not really that useful to think of tools as just tools, and of making things as simply a practical exercise in survival. Objects, and making and using them, are bound up in what it means to be the person you are. Think about your mobile ‘phone. Quite often it’s an everyday object that you use for practical things, like communication or finding information on the move. But you chose that particular ‘phone for various reasons, including its look and feel, the way you felt about it as much as the things it can do for you. Maybe even in response to advertising, or the ‘phones that your friends have. It is mundane and significant all at the same time. 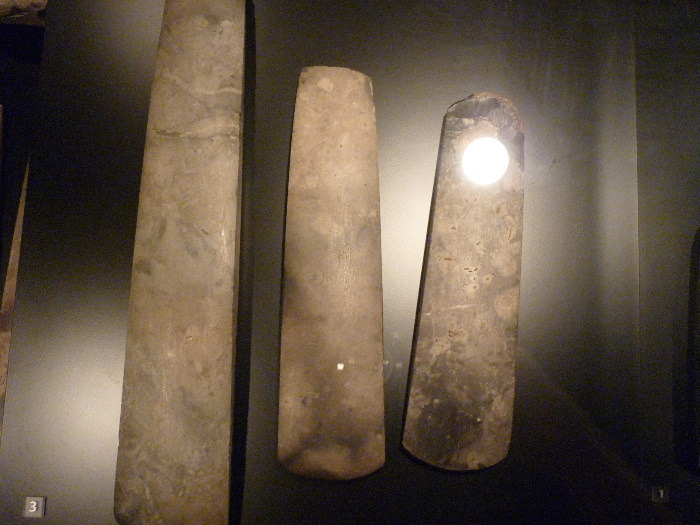 Stone tools, no matter their size, are also mundane and significant at the same time. This is why it is so important to study objects in relation to their context – where they were found, with what, how placed, and with what evidence for different use – and not as isolated things now on display in glass cabinets. A new cannibal fork, carved in yew from the great yew tree of St Mary’s. I love the contrast between the pale, creamy sapwood and the vibrant red heartwood. But in these photos you can spot some of the problems in the wood that come with the tree’s venerable age and illness. This post is about my frustrations with wood. You see before you the great yew tree of St Mary’s. It has stood hard by the church’s South Porch for more than 1000 years. It is a magnificent tree. It is also wounded, and sickly. One hundred, maybe two hundred, maybe three hundred, years ago, wrought iron bands and staples were bolted into the tree to try to hold it together. Now grown around with wood, the yew is clinging to this elderly corsetry. The huge bole is entirely hollow. It seems a miracle that the weighty, spreading top can be supported by the thin, twisted remains of the trunk. Mary must be looking kindly on the tree. The latest work to prolong the tree’s life has included considerable surgery. This resulted in a large pile of logs. Raw materials. Fire wood at the least; but hopefully bowls, spoons, hafts and other useful things. But the tree’s illness, its stresses and strains, show through. The wood is full of shakes, splits and cracks. 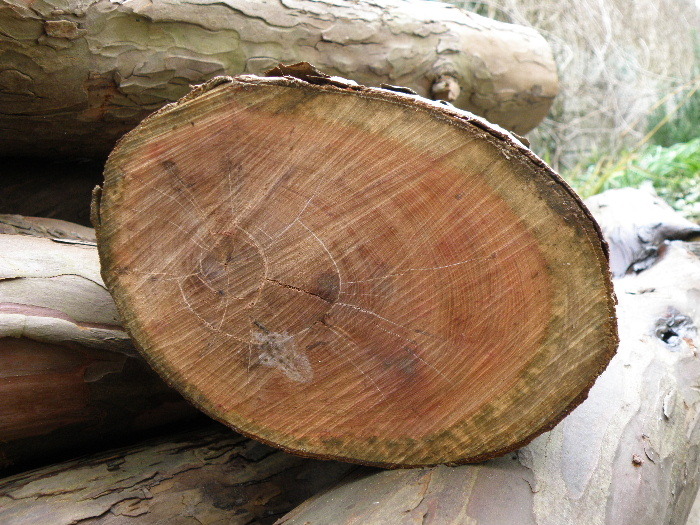 Look at those rings and stars in the red heartwood. These are causing my frustration. The creamy sapwood contrasts the red heartwood. I wanted to carve another parti-coloured cannibal fork, like the Elder Fork, so I took a length of branch about 10cm diameter and started to open it up. But the shakes inside the branch extend even to this narrow branch. Hidden splits run through it almost, but not quite, where I wanted to make cuts in the wood. “Double-fatal yew”. It kills you with poison, it kills you with power – unleashed from a longbow. 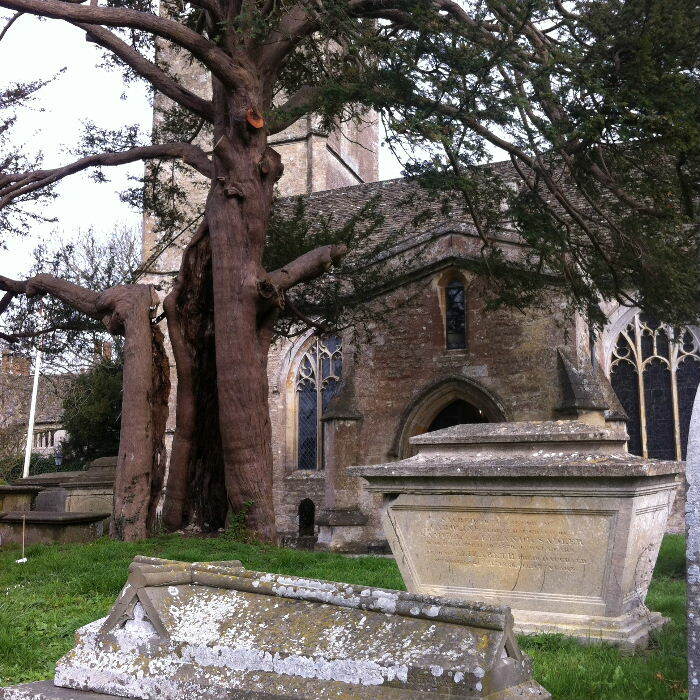 Something is doing its best to kill the great yew of St Mary’s. What’s shiny and sharp and comes by Royal Mail? This is the last post of a group of posts about the prize objects that I made earlier this year for a lucky Young Archaeologists’ Club Branch. I needed to make things which could be easily posted – small, and/or lightweight. The final object I decided to include is something that has fascinated me since I first discovered frullini back in 2009. Like the birch bark containers, this is another object excavated from waterlogged deposits in Alpine lake settlements. 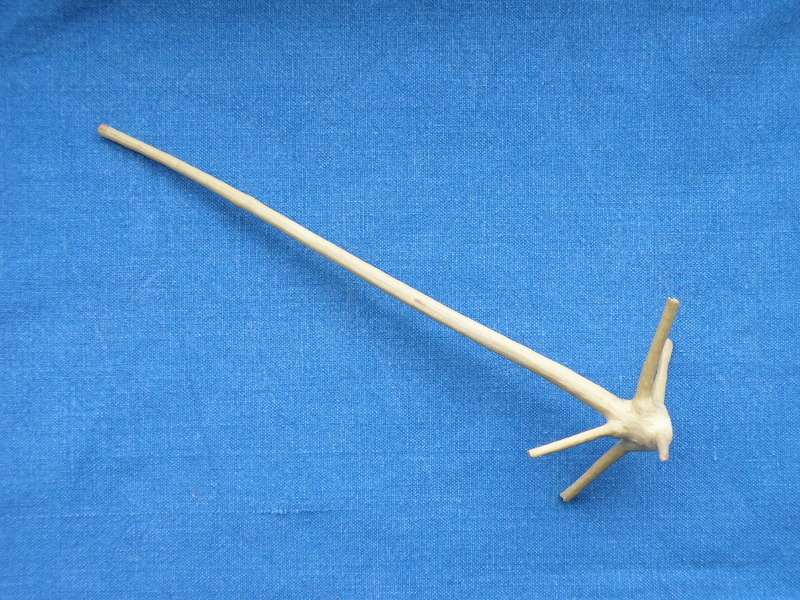 This little wooden whisk is based on Bronze Age examples from Fiavé. There are ethnological and historical examples of these tools used in cooking. The archaeological examples are most commonly made from the tops of Picea abies; the Christmas tree! At Fiavé, the numbers of frullini increase through time as the numbers of domesticated cattle increased, so the excavator proposed that the frullini were being used to make butter, as dairying became more important to the villagers. It’s good fun making these and even more fun trying them out. This is the third post of a group of posts about the prize objects that I made earlier this year for a lucky Young Archaeologists’ Club Branch. I needed to make things which could be easily posted – small, and/or lightweight. Some bone and antler artefacts seemed in order. This also meant I could stretch the date range covered by the objects in the group. The oldest and the youngest are made of bone. 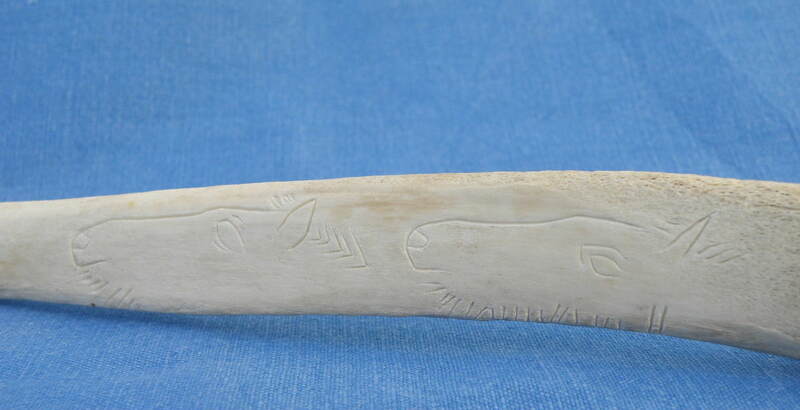 These incised horse heads on a rib are the oldest. The animal portraits are based on a find from Courbet Cave, in the Aveyron Valley (France). The original (in the British Museum, Palart.508) dates to around 11,000BC, and both sides of that rib are carved with horse heads. The original is also broken, but as the bone ends would then be jagged, sharp and fragile (not good for handling by YAC members!) I have kept the whole rib. It has been suggested that the horses are running, because their heads are raised, necks out-stretched and ears back. Showing the shape of the lower jaws and manes with shading lines rather than solid lines makes these very naturalistic depictions; the artist was depicting a symbol of a real thing, which is an important accomplishment for more than 12,500 years ago. 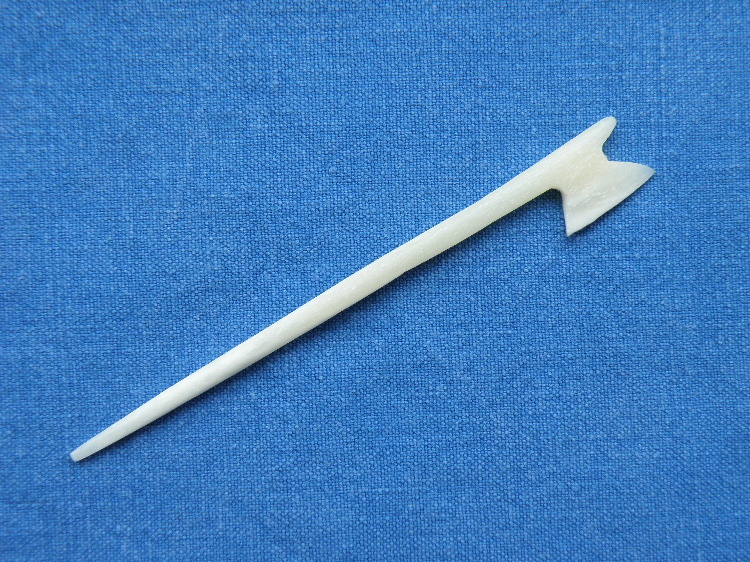 The youngest is this pin, cut and shaped from a piece of cow’s canon bone. It is based on a find from Jarlshof, Shetland. 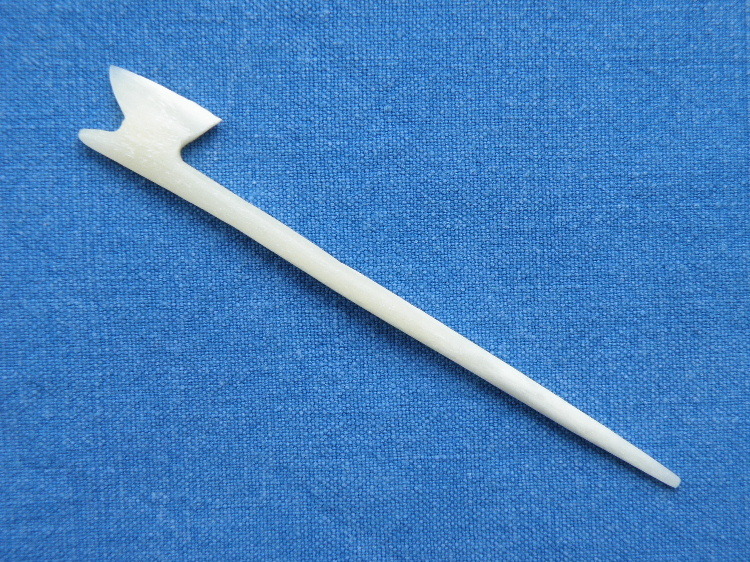 Pins with axe-shaped heads have been found from the late Roman period onwards; this example is Viking. Buttons didn’t come in until the medieval period, so until then pins and brooches (and straps and ties) were the commonest ways to fix clothing. Pins were probably used to fix hair, too. In the middle of the date range are these antler dice. The large die is based on a Romano-British find from Frocester Court villa (Gloucestershire). The two small dice are based on an early Anglo-Saxon find from Gilton Town (Kent). The Frocester Court die is actually made of ivory, but all three copies are made of antler. 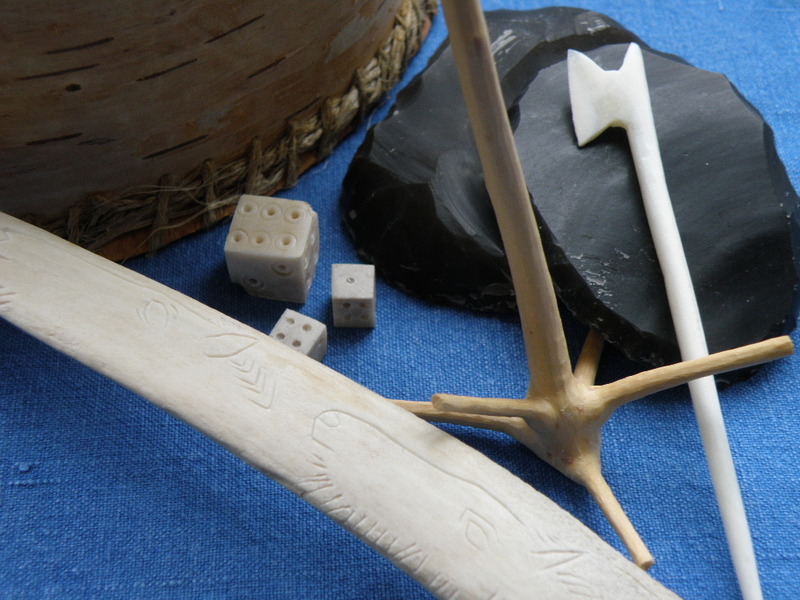 Ivory is not easy to get, for good reasons; and many archaeological dice were made of antler. 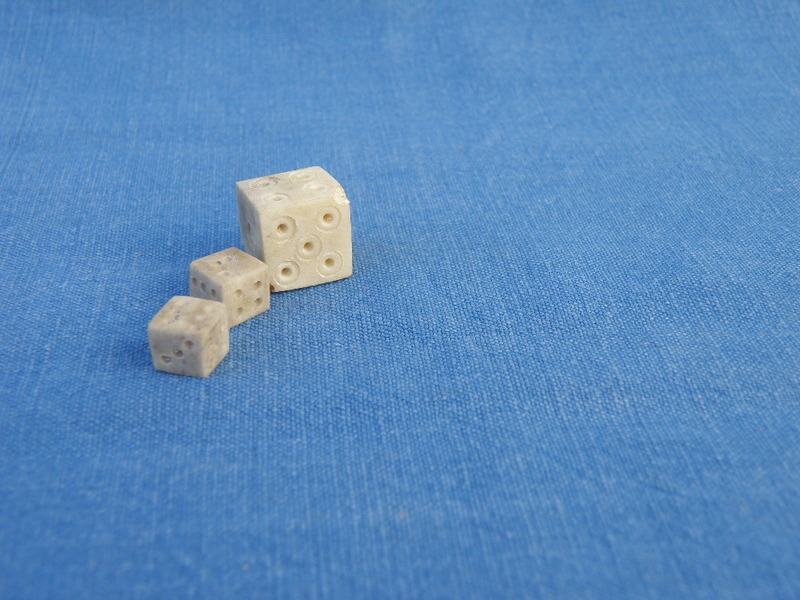 Cube-shaped dice were a Roman introduction. Before then, dice were longer and thinner, made from shafts of small long bones, and only had the numbers 3 to 6 carved on them. The commonest Roman numbering system for dice – which we still use today – is for the values of opposite sides to add up to 7. This is the second post of a group of posts about the prize objects that I made earlier this year for a lucky Young Archaeologists’ Club Branch. I needed to make things which could be easily posted – small, and/or lightweight. Having some nice, dark flint, I decided to include a couple of scrapers. These would be the heaviest items in the selection. The flint is dark, hard, glossy. Broad, smooth surfaces on either side contrast with the rough, re-touched cutting edges. They smell like sand, like salt spray on pebbles. They clink and ring and chime. 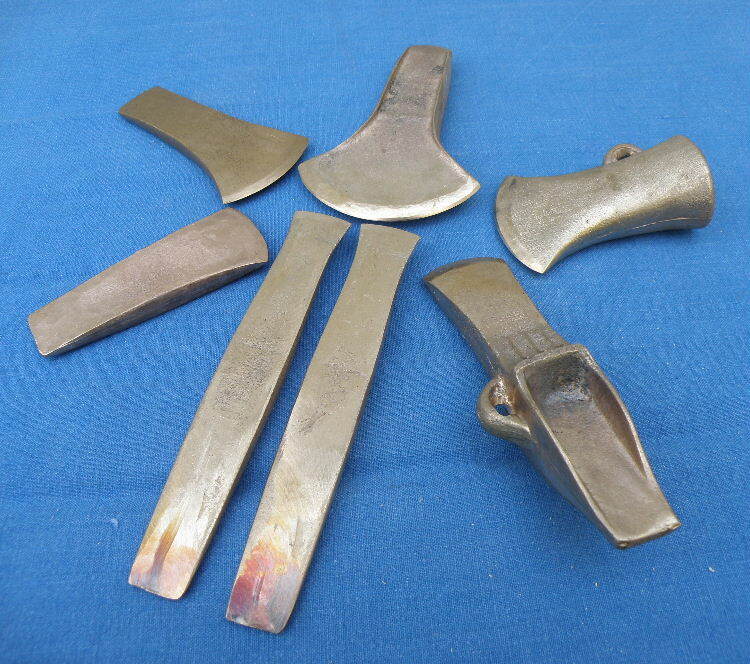 They are sharp tools, ready to be used on an animal hide to scrape away fat, membrane, hair. Large enough to be held and used in hand, and large enough to be hafted to a handle for extra pressure, direction and precision in use. There is just enough evidence on each scraper to understand the large flake that they started off as. Ripples betray the conchoidal fracture of the flint. The remains of the bulb of percussion can be seen and felt on the ventral surface. 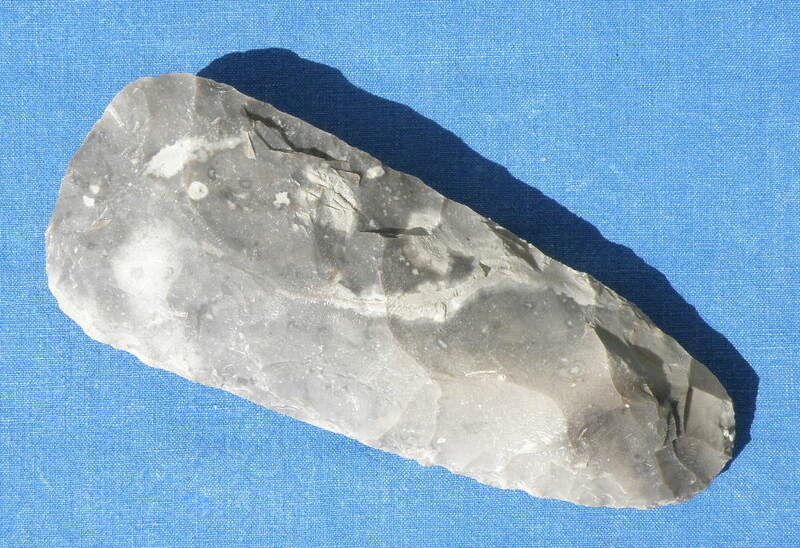 The flint came from chalk deposits in the south of England. 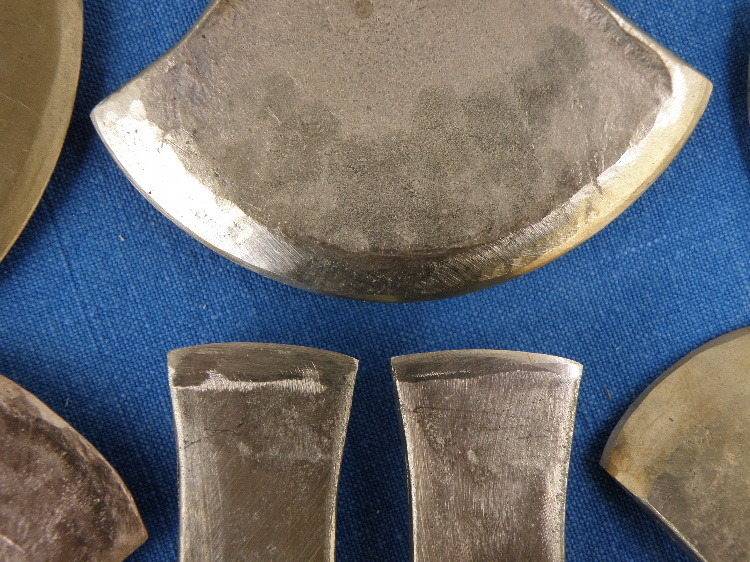 Scrapers are probably the commonest tool type in almost all periods of prehistory, and they are very varied. They likely had many uses, but they are really important in hide working, which is why I knap so many of them. This is the first post of a group of posts about the prize objects that I made earlier this year for a lucky Young Archaeologists’ Club Branch. The bark wasn’t the best for the job. It was old, thin, cracked, lumpy, papery. It had to be soaked to make, and keep, it pliable. There is a little repair to stitch up a crack. Silver Birch trees do not grow well where I live. The trees being cut by the tree surgeon were ornamental plantings that hadn’t been very successful. But I was lucky to have been passing as he was at work, and to gather up the logs into the back of my car with his blessing. Otherwise, I couldn’t have got the bark at all. I made the container using modern tools – specifically, a metal cutting blade and needle – so really it is a type of facsimile. Here is my definition of replica and facsimile. The container is based on a range of European finds from Neolithic sites. This means that it is not a direct copy of a single archaeological artefact. The shape and general method of construction were taken from the containers found with Ötzi in the Ötztal Alps on the Austria-Switzerland border. Otzi seems to have had two containers, one of which survived fairly well. This was about 20cm tall. Its oval base measured about 18cm at its widest point. There was no evidence for a lid. Only a tiny amount of the stitching survived in one of Ötzi’s containers. Details of the side stitching and base stitching methods in my facsimile were taken from finds at Sutz-Lattrigen-Rütte and Twan-Bahnhof, two Swiss lakeside settlement sites. The containers that I used for reference had been stitched with un-braided bast strips, so I used lengths of hemp (gathered as part of a raw materials swap for sinew and raw-hide, thanks Sally!) without twisting them into cord. However, I did braid up the lengths of hemp to go around the outside of the base, purely out of convenience and hopefully to give it a longer life. If something goes wrong, it will be harder for the new owners to fix than for me, if like Ötzi I was carrying the container as part of my own kit. The hemp smells wonderful, sort of smokey and sweet and sharp all at the same time. This “composite” approach, using information from different sources, was necessary because the evidence comes from fragile, partial, archaeological artefacts. Artefacts made of organic materials are rare in Europe unless from waterlogged or frozen contexts; and although birch bark technology is still used in North America, I would only use techniques and materials from that analogy if I thought they were appropriate to the task in hand and to the archaeological evidence.